My daughter asked for a set of night stands for Christmas to go with the bed I made her. 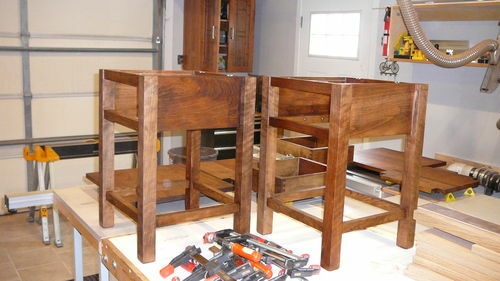 Nightstand wood is cherry, stained with dark walnut. 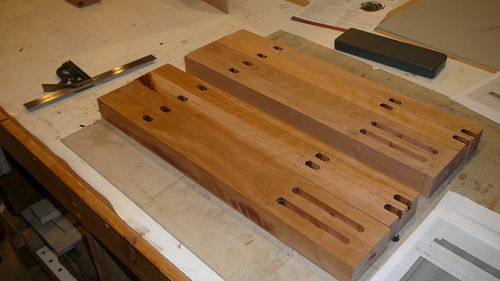 The drawer is maple, also stained with dark walnut. Everything is finished with a coat of sealer and 2 coats of sprayed polyurethane, sanded to 600 grit between coats, and rubbed down with 2500 grit scotch brite (like 0000 steel wool) before waxing and buffing. 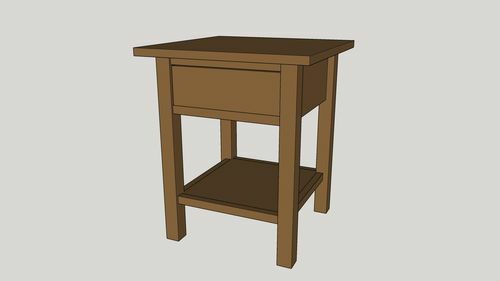 SketchUp is a pretty decent way to make a 3D model and create the necessary dimensional drawings for a project like this. 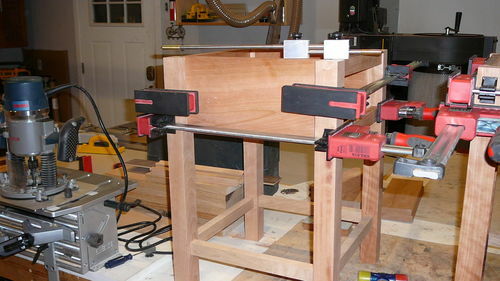 All of the joints were mortise and tenons so the Leigh Mortise and Tenon jig saw plenty of use. The drawer is little more than a basic half blind dovetail box that slides along the rails on the inside of the side aprons. 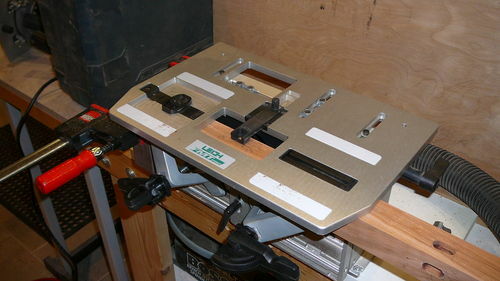 After a bit of messing about, the Leigh Dovetail jig was set up to make single pass half blind dovetails (sorry forgot to take pictures). It was ready for her on Christmas morning. 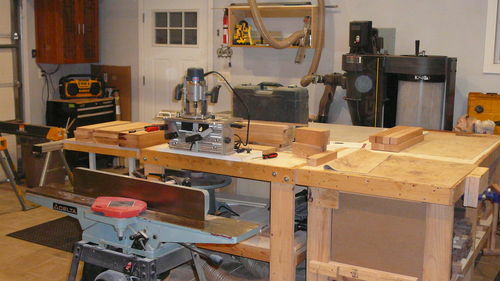 Nice work Earl (and impressively clean garage/shop 8^)! That looks like some nicely figured cherry and kudos for drawing up the plans to get a preview of the final project. Very nice work, I am sure she was well pleased with the finish product. Job well done! 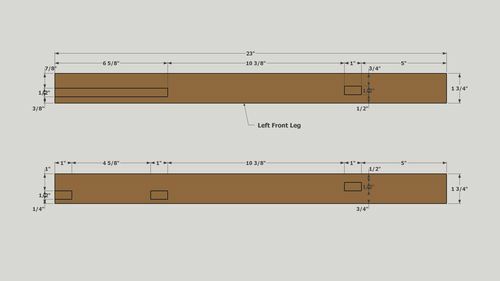 Splinter – even though I drew it up on SketchUp and had her look at the model she told me she wanted sides on the shelf after I finished building it. Oh well ?! 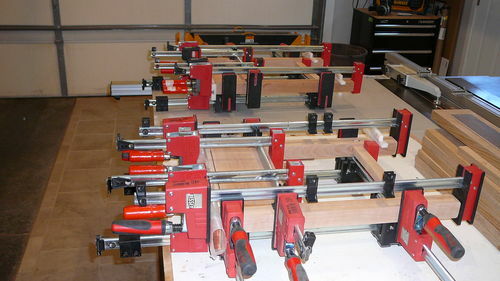 Dave – my mantra is “You can never have too many clamps”. If a few are good, more are better, much better. Nice job, Earl—just don’t show her any of those mallets you made for the tool swap! Nice. I love the style! your a good dad earl,nice work that im sure she appreciates very much.happy new year buddy. very nice – need to make a set for myself – thanks for posting all the photos as well! Excellent work. Great minds think alike on design. Lol. 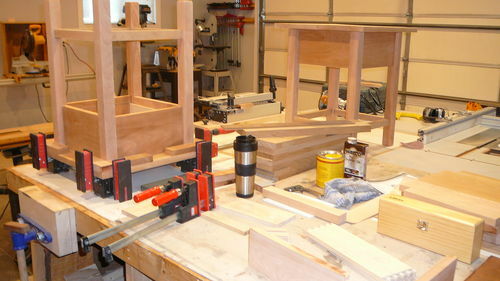 I like the mortise and tenon construction. I use sketchup on almost all of my projects too.